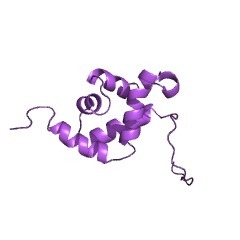 The CUT domain is a DNA-binding domain often found in combination with a downstream homeodomain. The CUT domain is a DNA-binding motif which can bind independently or in cooperation with the homeodomain, often found downstream of the CUT domain. 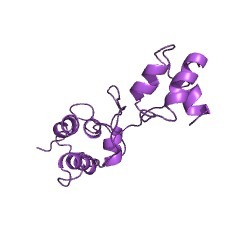 Multiple copies of the CUT domain can exist in one protein. 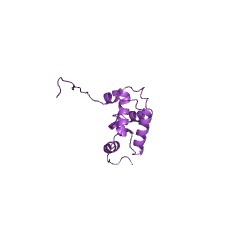 There are 7129 CUT domains in 3846 proteins in SMART's nrdb database. Taxonomic distribution of proteins containing CUT domain. This tree includes only several representative species. The complete taxonomic breakdown of all proteins with CUT domain is also avaliable. Click on the protein counts, or double click on taxonomic names to display all proteins containing CUT domain in the selected taxonomic class. Structural basis for recognition of the matrix attachment region of DNA bytranscription factor SATB1. Special AT-rich sequence binding protein 1 (SATB1) regulates gene expressionessential in immune T-cell maturation and switching of fetal globin species, bybinding to matrix attachment regions (MARs) of DNA and inducing a local chromatinremodeling. 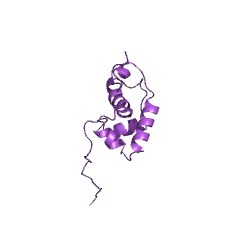 Previously we have revealed a five-helix structure of the N-terminal CUT domain, which is essentially the folded region in the MAR-binding domain, of human SATB1 by NMR. Here we determined crystal structure of the complex of theCUT domain and a MAR DNA, in which the third helix of the CUT domain deeplyenters the major groove of DNA in the B-form. 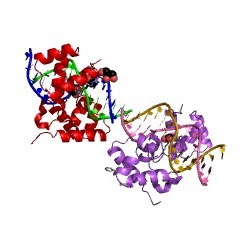 Bases of 5'-CTAATA-3' sequence are contacted by this helix, through direct and water-mediated hydrogen bonds andapolar and van der Waals contacts. Mutations at conserved base-contactingresidues, Gln402 and Gly403, reduced the DNA-binding activity, which confirmedthe importance of the observed interactions involving these residues. Asignificant number of equivalent contacts are observed also for typicallyfour-helix POU-specific domains of POU-homologous proteins, indicating that thesedomains share a common framework of the DNA-binding mode, recognizing partiallysimilar DNA sequences. Isoforms of hepatocyte nuclear factor-6 differ in DNA-binding properties, containa bifunctional homeodomain, and define the new ONECUT class of homeodomainproteins. 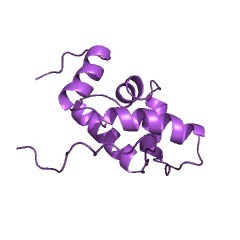 Hepatocyte nuclear factor-6 (HNF-6) contains a single cut domain and ahomeodomain characterized by a phenylalanine at position 48 and a methionine atposition 50. 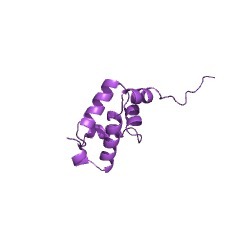 We describe here two isoforms of HNF-6 which differ by the linkerthat separates these domains. Both isoforms stimulated transcription. Theaffinity of HNF-6alpha and HNF-6beta for DNA differed, depending on the targetsequence. 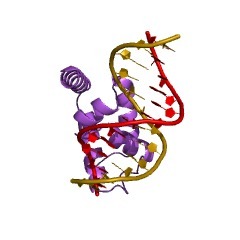 Binding of HNF-6 to DNA involved the cut domain and the homeodomain,but the latter was not required for binding to a subset of sites. Mutations ofthe F48M50 dyad that did not affect DNA binding reduced the transcriptionalstimulation of constructs that do not require the homeodomain for DNA binding,but did not affect the stimulation of constructs that do require the homeodomain.Comparative trees of mammalian, Drosophila, and Caenorhabditis elegans proteinsshowed that HNF-6 defines a new class, which we call ONECUT, of homeodomainproteins. 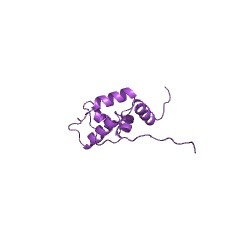 C. elegans proteins of this class bound to HNF-6 DNA targets. Thus,depending on their sequence, these targets determine for HNF-6 at least two modesof DNA binding, which hinge on the homeodomain and on the linker that separatesit from the cut domain, and two modes of transcriptional stimulation, which hingeon the homeodomain.